2 bedrooms, 2 full bathrooms, 200 sf patio, sleeps 4. Dock of the Bay Condo. Rare 2 level, 2 bedroom, 2 full bath executive clean modern waterfront condo with 200 sf fully furnished private patio and beautiful views of the Williamette River from the living room, breakfast counter, bedrooms and patio. Fully equipped gourmet kitchen with complete Bialetti cookware set, Cuisinart blender/food processor, Keurig coffee machine, rice maker, custom furniture by local artisans, brand new Natuzzi premium leather couch, queen beds with new memory foam mattresses, spacious closets and dressers in both bedrooms, 47' flat screen LCD/LED HD Sony Bravia TV, Sony Home Theatre, Blu-ray DVD, streaming Netflix, Pandora and high speed wireless Comcast internet, washer and dryer. Pool and spa just steps away. Professional work station equipped with printer and office supplies: bring your laptop or smart phone and you're ready to go. Off the street dedicated parking space. Perfect for executives, romantic vacations or family fun. Right on the Water: Relax on the couch and you feel like you're sitting on the dock of the bay. Dine, entertain or just hang out with a glass of wine on your fully furnished 200 sf foot private terrace on the river and watch otter, Canadian geese, ducks, heron, cormorants and gulls skim over the water by day. Tug boats ply their trade, pushing barges while fisherman troll for prized Chinook salmon. Lights twinkle on the river by night. toilet, combination tub/shower, Toilet paper provided. Towels and washcloths provided; hair dryer provided. 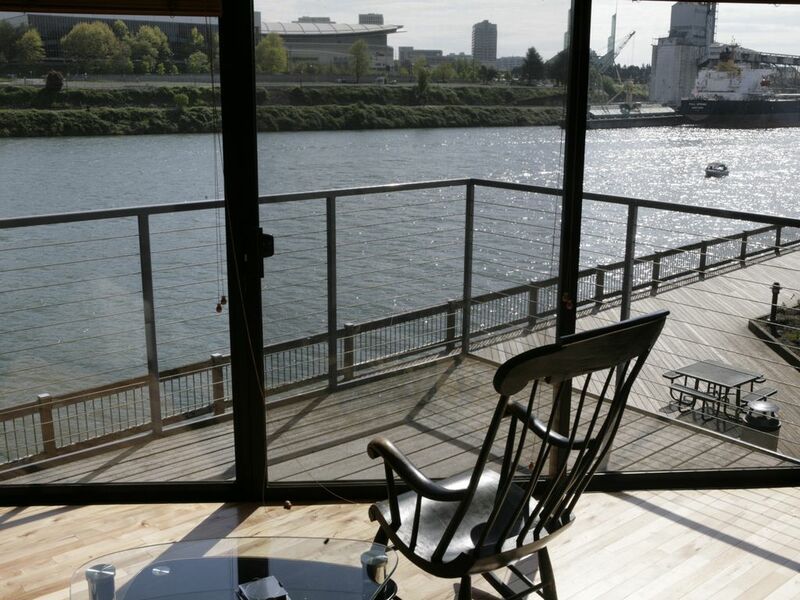 Dock of the Bay Condo is right on the Willamette River -- stunning views from both decks, the living/dining area and upstairs bedroom. Local activities: Cycling along the Springwater Trail, gourmet restaurants in Foodie Heaven, swimming, walking, hiking, antiquing, rollerblading, eco tourism, bird watching, live theatre, waterfront festivals, Saturday market. Second Floor Condo with excellent view. Housekeeping services available for an extra fee for extended stays. Printer furnished at work station. You will find all you need for you stay when you arrive. The location is great to get to downtown and everywhere else. We had a great time! The condo was a great location with great views of the river and great space in the condo. It was the most well stocked condo we have ever stayed in from paper products to soaps and lotions and coffee for the Kurig. The owner was quick to respond to any of our questions and provided lots of information on Portland and the surrounding area. Our stay at the "Dock of the Bay" was most enjoyable. We found the condo to be extremely well-equipped, clean, and were most pleased with the layout. The master is upstairs with a bathroom and the second bedroom is downstairs with a bathroom. We had friends come and stay and it worked out perfectly. We thoroughly enjoyed watching the activity on the river from both decks and ate most of our dinners on the upstairs patio. It was delightful and one of our favorite perks of the unit. The location worked well for us. We biked and walked most places which was easy and great fun. There is a place to lock your bikes which was convenient. I would highly recommend this unit!! We have rented several vacation homes in the past & none of them have compared with the " dock of the bay" condo. The unit was very clean, everything worked as expected & it was equipped with everything you need....from shampoo, body wash, lotions, hair dryers, etc. in the bathrooms. The kitchen was also nicely equipped including lots of spices, oils, cooking spray, & lots of cooking utensils. Even a printer & wifi. Too many other things included to list all. We would definitely stay here again. I would also like to thank owner, Cate, for her continual communication to make sure we were satisfied with her rental home. Thank you, Cate. The second time we stayed here. The condo is truly wonderful. Roomy, glorious decks overlooking the river, clean, well stocked, and the best location - walking distance to almost everything. Cate is the perfect hostess. Walk or take public transit everywhere. Dock of the Bay Condo is located right above the 15 mile river hike/bike Springwater Trail. Short walk to excellent coffee, bakeries, Saturday Market on the river, downtown shopping, Convention Center, Amtrak, Chinese Garden, waterfront festivals, world famous micro breweries, games & concerts at the Rose Garden Arena, art galleries in the Pearl District & a huge variety of gourmet restaurants in the foodie heaven called Portland. You have a dedicated off-street parking space but there is no need for a car as Portland sports one of the best public transportation systems in the nation. Hop on the MAX lite-rail at the airport and arrive a short walk (2 blocks) from the condo. The MAX takes you to all corners of Portland: the Rose Garden, Portland Zoo, Children’s Museum, hikes in Forest Park, Japanese Garden, Pittock Mansion, Pioneer Square. Take the Portland Trolley through Northwest Portland's upscale shopping district & to the South Waterfront.